Suggested Use: One capsule daily, or as directed by your qualified healthcare provider. Indole-3-carbinol: You don’t need to eat broccoli to ward off cancer. Indole-3-carbinol (I3C) is a substance that results from cooking or crushing cruciferous vegetables, such as broccoli, brussels sprouts, and cauliflower. shrink existing tumors in some tissues (e.g. breast, cervix). There is also evidence suggesting that I3C should be avoided by people with liver cancer. Most clinical work with I3C uses dosages from 200 mg/day to 400 mg/day. The optimum dosage for dealing with breast cancer is thought to be 400 mg/day. 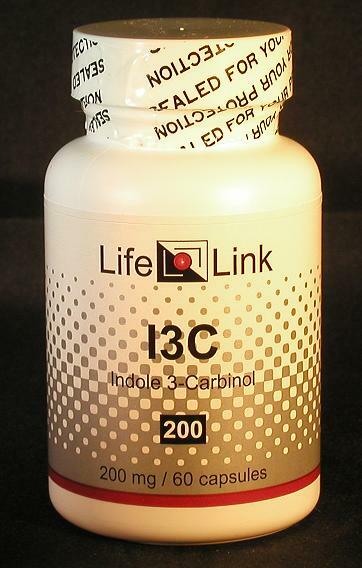 This article is a condensed version of Dr. Zarkov’s summary of medical research into I3C supplementation on the LifeLink website. Indole-3-carbinol (I3C) is a substance that results from cooking or crushing certain plant foods — especially ‘cruciferous vegetables’, which include broccoli, brussels sprouts, and cauliflower. Enzymes in the plants convert certain biochemicals into I3C. Stomach acid converts I3C into other compounds (such as ‘DIM’), some of which have anti-cancer activity. Accordingly, we will limit our discussion of indole-3-carbinol to a brief summary of relevant research, and let you draw your own conclusions about what medical conditions it may be effective in treating. For general information about I3C, we recommend the reviews by Rogan1, Thorne2, Stoewsand3, and Broadbent4,5. More specialized reviews are those by Aggarwal6, Shertzer7, and Kim8. Interest in I3C as an anti-cancer agent dates back at least to the 1970s when it was shown that I3C inhibits the formation of breast cancer tumors in rats.11 Ethnic food studies soon showed that diets high in cruciferous vegetables are correlated with lower rates of breast cancer.10 Despite this promising beginning, the medical research community did not take a serious interest in I3C until the 1990s, when it became available as a nutritional supplement and women began to use it successfully to treat cervical dysplasia. Other potential applications of I3C include the prevention or treatment of: • prostate cancer • melanoma • non-melanoma skin cancer • lung cancer • colon cancer • recurrent respiratory papillomatosis • herpes simplex • fetal cancer • Alzheimer’s • ovulation. Does I3C shrink existing tumors? Several experiments with high-dose I3C in fish and in rats led some researchers to believe that if I3C supplementation were delayed until after a tumor had already developed, the growth of that tumor might actually be accelerated by I3C.10,34,35,36,37 Other experiments, however, have shown that I3C can kill tumor cells, at least in certain tissues.14,26,37 Since no appropriate experiments have been done on real tumors in humans, the issue has not yet been resolved. enlarge existing tumors in other tissues (especially the liver)37. I3C has anti-ovulatory properties, as was shown in rats in 2002.30 Regular I3C supplementation could be a useful back-up for one’s regular anti-pregnancy method. Why take I3C as a supplement when you could instead just eat lots of broccoli or other cruciferous vegetables? There are two reasons: first, the vegetables contain many alkaloidal substances, some of them harmful; second, you have no way of knowing whether a given serving of a vegetable has a lot or only a little of the I3C-related substances you are trying to consume. Supplement capsules solve both of these problems. Are I3C supplements useful for the conditions and purposes mentioned above? We aren’t allowed to tell you, so you should take a look at some of the references cited here, and then decide for yourself. Indole-3-carbinol (I3C) induced cell growth inhibition, G1 cell cycle arrest and apoptosis in prostate cancer cells. Oncogene 2001 May 24;20(23):2927-36 Chinni SR, Li Y, Upadhyay S, Koppolu PK, Sarkar FH. BHT, distantly related in structure to vitamin E, is an antioxidant that was once widely used to protect food from damage by oxidation and microorganisms. It is frequently used as an anti-aging supplement.